Barnes and Noble considered the community’s needs when designing their new 20,114-square-foot store. Lower profile bookshelves will provide customers with a panoramic view of the store, contributing to an open and airy feel. Two large “book theaters” invite customers to discover books in a new 360-degree experience. Additionally, the store at the Staten Island Mall will feature local writers and artists. The Children’s Section – with a dedicated LEGO® activity table and bright pops of brick red and yellow – creates a special environment for Barnes & Noble’s youngest customers. A whimsical “jungle gym” display feature, which is unique to this prototype and is built specially for toys and popular children’s characters, adds a sense of fun to the Children’s Section. The large and open lobby provides community seating around a table and individual comfortable chairs. 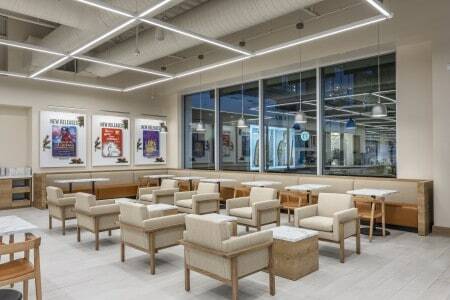 Customers will have a variety of seating options throughout the store, allowing them to curl up alone with a good book or gather with a small group of friends. Barnes and Noble welcome the Staten Island community to visit, spend some time exploring and enjoy the experience. DISCLAIMER: Staten Island NYC Living received promotional items in return for coverage of their new store. All thoughts and content belong to Staten Island NYC Living and are not influenced by Barnes and Noble or their affiliates.